UN Secretary General, Mr. Kofi Annan, hailed the relief efforts led by the Liberation Tigers in the wake of the Asian tsunami of December 26th and expressed his disappointment over the Sri Lankan governments veto of his plans to visit LTTE held areas devastated by the waves, when he met Tamil parliamentarians Sunday. Mr. Annan, who is on a tour of the tsunami-struck indian ocean countries, told MPs of the Tamil National Alliance (TNA), that he had been informed of the severity of the destruction along Sri Lanka's east coast and had hoped to assess the aid effort that was required, TNA MPs said. "I commend the LTTE and the TRO for the very good work they have been doing", he told the MPs. UN officials told reporters Saturday that the Sri Lankan government had vetoed Mr. Annan's request to visit the areas such as Mullaithivu and southern parts of the Jaffna peninsula where several thousand people were killed and many large villages destroyed when the waves struck. Mr. Annan had accepted that given the urgency of the situation, the delivery of humanitarian aid should not be a political issue, the TNA MPs said. 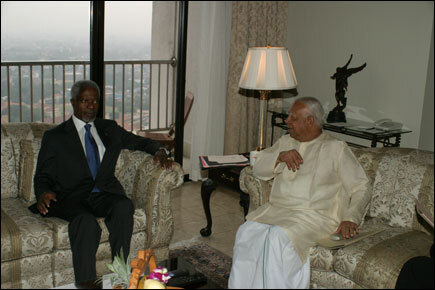 Mr. Annan said he hoped to be premitted to visit the areas such as Mullaithivu on another visit to Sri Lanka, the TNA MPs said. The Secretary General met with the TNA delegation comprsing Mr. R. Sampanthan, TNA's parliamentary group leader and Mr.Gajendrakumar Ponnambalam, Jaffna district TNA parliamentarian Sunday morning at the Jai Hilton Hotel where he is staying and discussed the damage caused by the Tsunami in the NothEast. The TNA delegation elaborated in detail on the ground situation in the Tamil dominated NorthEast province after the Tsunami disaster and the shortcomings, discrimination and delay in channeling the relief received from foreign governments and foreign aid agencies to the province by the Government of Sri Lanka (GOSL), TNA MPs told TamilNet. The delegation expressed concern over the centralised distribution of relief materials to Tsunami victims sheltered in welfare centres bypassing the District Task Force formed for the purpose. TNA also expressed its dissatisfaction over the takeover of the management of welfare camps by the Sri Lanka Army on a directive by Sri Lanka's President. Mr.Annan learnt that the entire coastal areas of the NorthEast province has been devastated and needed urgent attention to rehabilitate the victims, and that the Tsunami has worsened the lives of northeast people who have been battered by the two-decade old war, TNA MPs said. The UN Secretary General is due to meet President Chandrika Kumaratunga and Mr.Ranil Wickremasinghe, the leader of the main opposition United National Party (UNP) and former Prime Minister, later Sunday, sources said.